Two companies launched last week that will try to build a business catering solely to Flickr customers – FlickrInspector and Preloadr. Coincidentally, both companies are located in Europe. FlickrInspector is a simple tool that uses the Flickr API to provide information about a particular flickr user. Photos, tags, contacts’ photos, sets (albums) etc. can all be viewed on the site, for any Flickr user. 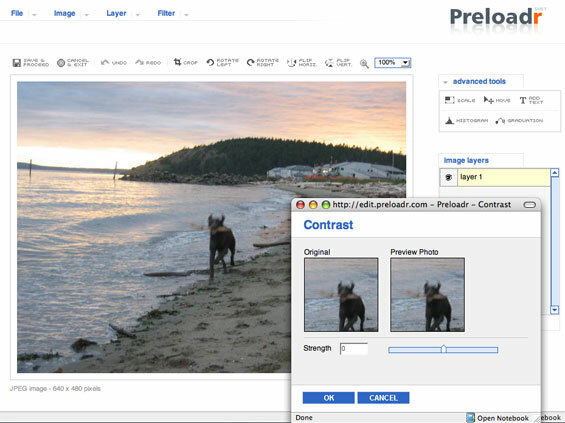 Preloadr is a very useful flickr-based photo editing tool. They’ve integrated the Flickr API with nexImage photo editing software and presented it as a new, free online service. No registration is required (or even possible) – you simply log on to your flickr account through the Preloadr site. Pictures can be uploaded, edited and transferred to Flickr, or pictures can be pulled from Flickr, edited on Preloadr and moved back over to Flickr. There are several editing tools like cropping, sharpening, color correction and more. The only thing it doesn’t have, unless I’m missing it, is a cure-all “enhance” button that seems to work so often in iPhoto. A red-eye remover would also be appreciated, as mentioned in this blog. Preloadr is not the only, or even the best, online photo editing service. My favorite is PXN8, which also offers Flickr integration. Others include Creating Online, Snipshot and Picture2Life.